On Saturday night, Ken Vincent and Traeger di Pietro will co-create a painting and project it on the Edgartown Lighthouse. 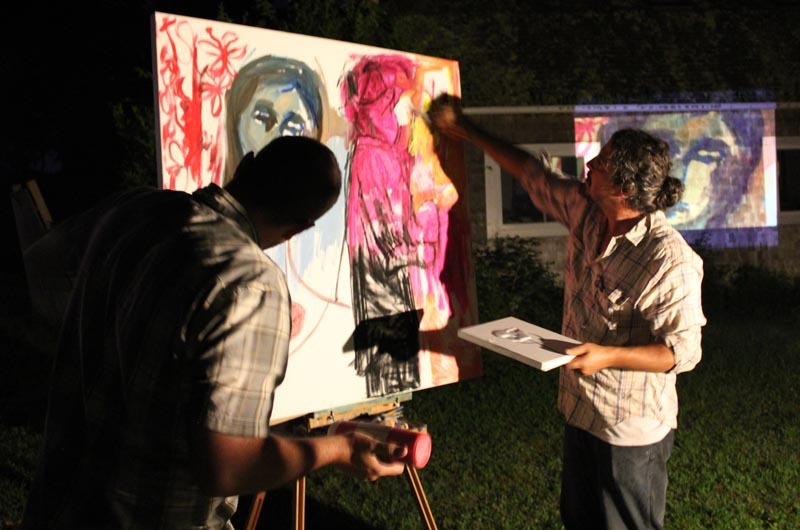 After sundown on Monday, artists Ken Vincent and Traeger di Pietro unloaded a canvas, easel, and bag of supplies from their cars and carried them out to Christopher Mara’s backyard. A projector — the same one that displays movies every Wednesday at the Chilmark Community Center for the Martha’s Vineyard Film Festival — was turned on, casting a blank white rectangle on the shingled wall of its operator’s home. Mr. Vincent and Mr. di Pietro then set up a French easel and placed a square canvas on its ledge. Blank, like the projection, it begged for the artists’ attention. Mr. Vincent approached the painting. In shades of blue, he painted a woman’s face on the left side of the canvas. Then simultaneously, Mr. di Pietro added a man wearing a fedora to the image using red paint and charcoal. 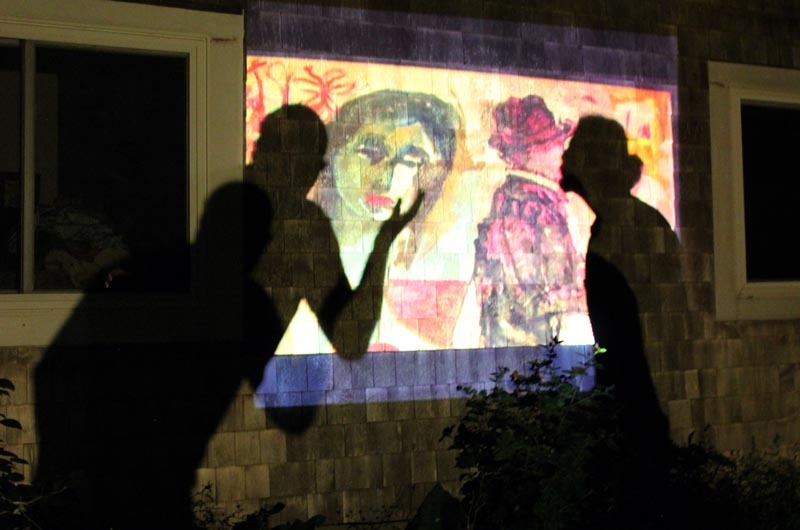 While the two painted alongside each other, a camera set on a tripod captured their creation in real time, broadcasting the image via the projector onto the side of the shingled house. Mr. Vincent and Mr. di Pietro were in a sense painting in two places at once, on a canvas and on the side of the house. It’s something they had never tried before. They call it street light art. Monday night was just the dress rehearsal for the real street light art project they’ve been preparing for the last month. On Saturday, August 16, Mr. Vincent and Mr. di Pietro will set up the easel, light, camera and projector at Edgartown’s Lighthouse Beach. Come nightfall, they will begin a new mixed media painting. As they fill the blank canvas, their brush strokes will be projected onto a surface far more intriguing than weathered cedar shingles — the Edgartown Lighthouse, which the Martha’s Vineyard Museum donated for the artists’ use on Saturday. Mr. Vincent and Mr. di Pietro’s goal is for the live projection to be visible from the porch of the Harbor View Hotel, but they are hoping to reach a wider audience than just the hotel’s guests. Any and all who pass by are invited to sit on the beach, or observe from Water street as Mr. Vincent and Mr. di Pietro work on the painting from 8 to 10 p.m. Though the artists will not plan every detail of what the final painting will look like, they do have a particular theme in mind. The painting will be a blend of Mr. Vincent’s geometric abstract style and Mr. di Pietro’s contemporary mixed media style. Though the artists will paint at the same time, there will be no paintbrush sparring. Mr. di Pietro is right-handed and Mr. Vincent is a lefty. They’ve planned their workspace accordingly. After the event, the artists will put the piece up for sale. Proceeds will be donated to the Martha’s Vineyard Public Charter School art department, where Mr. Vincent teaches, and the National Breast Cancer Foundation, an organization selected by Mr. di Pietro. Mr. Vincent and Mr. di Pietro said that the end product of this project, however, is far less important than the process of painting it. That’s why they’ve decided to project their artistic process over the course of a couple of hours, and not just an image of the finished painting. Now that Mr. Vincent and Mr. di Pietro have worked out most of the kinks — the size and sharpness of the projection, how far to station the projector from the lighthouse, what direction to light the painting from so it registers well on camera — they are eager to begin work. But the two have hope for the project’s success. They’d also love to get more artists and children involved in this type of work in the future. Right now, though, they’re enjoying taking the first steps into new artistic territory.